Chick health… well poultry in general. Regardless of the species their needs, particularly in the early stages are very similar. We quite often get questions about how to look after young birds. Whether it is from people buying birds from us, or just general ‘chicken rearing questions’ so I thought as I was setting up the brooder; I’d address a few. So we had a few more Indian Game chicks hatch this week. And it doesn’t really matter if the birds are hatched in an incubator, by a broody or purchased as ‘day olds’ the general care requirements remain the same. Warmth, shelter, food and water and obviously being clean and dry helps too. often anyway. We did have a hen that would often vanish and re-appear a few weeks later with a brood in tow. She was rather resourceful and a very attentive mother. However as a general we incubate and raise the chicks in a brooder- shelter. 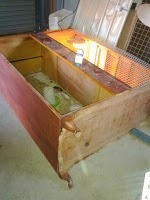 Our brooder is a converted old wardrobe, with mesh where the door used to be. This allows us to use draws to divide the spaces and have multiple stages of birds at any one time. Handy when you rear a breed such as Indian Games that do not lay often and have a lower fertility rate- Therefore you incubate whatever you get, as you get it! Now to keep the base of the box clean and dry you can use old newspapers, magazines etc. These can be changed out quite easily and may still be composted afterwards. But try not to use anything too glossy, as this can cause spayed legs; as the chicks are quite malleable at this stage if their legs slide apart, it may become a permanent problem. So for traction and to absorb fluids (spilled water, poop etc) we use a scatter of wood shavings too. Again these are easily cleaned out and are compost able once used. For warmth we have installed bulbs. Under new regulations here all bulbs need to be ‘energy efficient’. Which is actually a little bit of a problem, since the biggest ‘waste’ for bulbs is heat; where in this instance this is the purpose. So be aware of what your light is capable of holding. As a lamp that would have held a 60 watt bulb will now only be able to use a maximum of 42 watts. Which will not generate a lot of heat. Again lights can be as expensive, and/or permanent as you like. We have a larger capacity light that is permanently fixed to the side of the brooder. This space is for the youngest birds. As, as they get bigger and develop feathers hey will become more capable of regulating their ow body temperature. This light is also fixed the the side of the brooder that is able to be divided. This also allows us to manipulate the space the birds occupy, and it can grow with the birds. As a small number of day old birds do not need as much room as 2-3 week olds of more numbers. And whilst in general we’re advocates for providing as much space as possible for the birds, as day olds they will not move too far from the light. And the more space they have the colder the space will be. It’s easier to heat up a smaller space; this maybe worth considering when sourcing your brooder. You do need enough room for them to move away from the light, if they are too hot. So if you are unsure check the temperature with a thermometer. We try and keep ours about 20°c but under 32°c (their incubator was only 37.5°c). When initially setting up your brooder you will need to provide your chicks with a source of water. For our first day olds we used a small plastic container lid. As the actual container would have been too tall for them to reach and we were concerned about them getting in it and being wet and/or drowning. This is a fair concern, as we have lost chicks that we have left outside with their mums to larger water containers. Also you are keeping them warm as they are unable to regulate their own body temperatures. Being wet is one of the quickest ways to cool down. Now we have store bought waterers- plastic containers that maintain a water level from a water reserve. We have had issues with poults (baby turkeys) and those available with large lips; as they fall asleep in the dish and drown. So we prefer to use the narrow lipped designs, and only use the larger lipped version for older chicks- few weeks onwards. When initially introducing your new chicks to their brooder it is important that you introduce each chick to the water- dip their beak in it before placing them down. I have never heard of, or read that this is necessary with food. 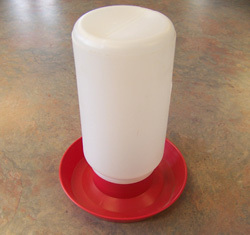 Again food can be offered in containers or specially purchased feeders. Be aware that if they can get in the container/feeder they will. And their natural instinct is to scratch, so this will probably mean cleaning the box out more oftern and topping up their feed. They are fascinating to watch though, and will also instinctively chase and eat bugs etc. For the feed itself, you can purchase ‘chick starter’ from most farm supply stores and many pet shops. Although in the past we have preferred to use a ‘meat bird’ starter. As it is mostly the same and still finely ground for young birds, but has a higher protein content. And is suitable for other species such as turkeys, ducks and geese. Both are also medicated to treat for conditions such as coccidiousis. At the moment we are feeding our chicks a combination of a fine grain mix (purchased directly fro the grower) with a molasses protein meal (again purchased directly). This we also use as a supplement for our cows and pigs. This does mean that we treat our chicks directly, for the medications. Now in general we don’t review products, or even advise on what to use But it was actually me cleaning out the chicks waterer for the new arrivals (as you don’t want to cross contaminate feeders etc between older chicks and day olds. Not that any of our birds have been ill, just you can never be too careful. And then medicating their clean water that lead me to write this post. As I’ve covered basic chick needs before. But when I get asked about raising birds or look at buying any I always ask if they have been treated for any of these things. Chicks can also be vaccinated against a few ailments/illnesses too. But this tends to be something that happens in large scale hatcheries and not your back yard breeder. After all most people will raise poultry with little to no health concerns… but it doesn’t hurt to know. So we add a product called coccivet for coccidiousis and kilverm for worms. The kilverm is suitable for use for poultry and swine. As we keep both, this is the product we use, however there are plenty of other water soluble worming products available. Poultry of all ages require worming, so it can be helpful to do it on a routine date each month. The coccidiousis however is only really a concern to young fowl. It is a condition that is passed through faeces and is generally associated with mass production. But I guess you can never be too careful. And since the feeds generally cover this, but we are not using medicated feed, we’re just covering all bases. Another issue that I have seen a lot of discussion amongst chicken forums etc recently (must be he weather) is respiratory issues. This isn’t really an issue affecting chicks, but older poultry. As we breed Indian Games we were advised to look into a product called ‘Breath-ezy’. Following us culling our first few birds, due to wheezing and mucky eyes/ beaks through fear it could be something more serious. Fortunately these new birds were still in ‘quarantine’- I would advise anyone introducing new birds from another location do this, before integrating the to their own flock. To minimise the risk of your existing birds being exposed. We were told it can be a problem with the breed in colder weather and wasn’t likely to have been a major issue. But we had already dispatched of the birds to be sure. Fortunately since then we have not had to use it for that purpose. But we have continued to purchase the product for general poultry hygiene. As it is a water-based cleaning product suitable for poultry housing as well as other animals; being water based means it can be used with our enviro- sewerage system. So we use it for routine cleaning of our incubator, brooder boxes and waterers and feeders. Believe me once you have had chicks/birds for a while you will appreciate how mucky these can get!